Just a quick update on the last couple of weeks! Mae and I have been having lots of fun on our weekly Wednesday play dates with Anna/Jen and Isaac/Stacey. Last week we had absolutely gorgeous weather and went to the zoo. The highlight of the trip was definitely getting blue soft serve ice cream at the end. Oh, and seeing animals. But mostly the ice cream. Dan's computer totally bit the dust a couple weeks ago. Fortunately we didn't have much stored on there. Apparently Shutterfly recently added the capability to download high resolution versions of your photos, so we can even recover full versions all our wedding photos that we had stored on that computer (and thankfully online too!). Since Dan had just upgraded his video card, he decided to take a stab at building his new desktop from scratch. This involved A LOT of components. We had a bit of a scare when, after two days of meticulous assembling, he hit the power button and nothing happened. Then, he realized he hadn't flipped the switch on the power supply. As soon as he did that, little colorful LED lights started flickering inside. Dan avoided buying any overly gaudy components, but he did buy a case with a window so we can admire his handiwork. Its glowing red lights creepily stare at me when I walk by. In the not-so-fun news, this weekend I survived a major mommy milestone: catching my kid's barf in my hands for the first time. So gross. We're not sure if Mae had a little stomach bug or if this is just another side effect of teething. I KNOW, MORE TEETH. This poor kid. She now has both upper molars and the lower left just broke the surface. 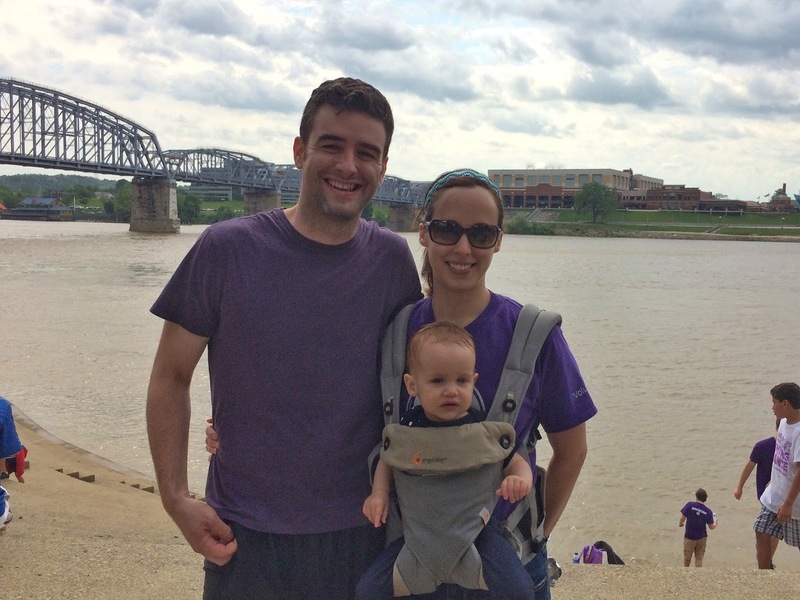 Despite her "bummy tummy" as Dan nicknamed it, Mae still had fun participating in the March for Babies with us this weekend. We filled out a little "Why I Walk" banner with Nolan's name and attached it to the stroller. She enjoyed the early morning stroller ride (until the end when she managed to barf on my arm and Dan's leg at the same time... babies are disgusting sometimes). We are currently preparing for Mae's first birthday and finally catching up on some much-needed baby-proofing. We have another couple of busy weeks ahead of us!